The planned April shutdown of the Google-Plus social network, where we hosted a longtime “community” on American Mafia history, prompted us to look into alternative methods of communicating with the 437 existing members of the community and other interested individuals. After some research, we decided to assemble a phpBB-based Forum. In its opening months, the forum welcomed more than 70 new members. We expect that the membership total will grow significantly following the death of Google-Plus next week. With website security becoming an important issue for visitors, we took a number of security-related steps. First, we added “Cookies notification” messages to our main entry “Home” page and our “About” page. We hope that this will be sufficient to address tracking-cookie concerns expressed by countries in the European Union. (While the site does not directly engage in the creation of tracking cookies, it does benefit from Google analytics and advertising programs that track visitor IP addresses and browser software.) The “About” page now also includes a discussion of user privacy. We do not directly engage in e-commerce on the site and have no logical need for encryption. However, we became aware that web search engines were lowering the search results rankings of sites – even non-commercial sites like ours – that were not security-verified and encrypted (regular “http” sites). As a result, we added security encryption. Site pages can now be accessed through the secure “https” protocol. Gov’t Doc – Pennsylvania Crime Commission 1970. In addition, local Mafia boss listings have been revised and reformatted. And the Article listings have been revised to include links to related articles posted on the Writers of Wrongs website. Editor/publisher of crime history journal, Informer. 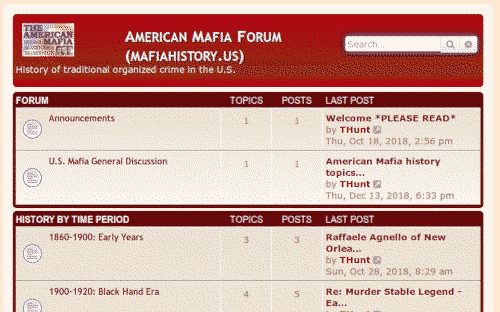 Publisher of American Mafia history website mafiahistory.us. Moderator of Mafia-related online forums. Author of Wrongly Executed? Coauthor of Deep Water: Joseph P. Macheca and the Birth of the American Mafia and DiCarlo: Buffalo's First Family of Crime. Contributor of American Mafia history to Australian-published Mafia: The Necessary Reference to Organized Crime. Writer/co-writer of crime history articles for Informer, On the Spot Journal, Cigar City Magazine, Tampa Mafia Magazine.